Next time you’re driving down Baja, try to hit Ensenada on a Sunday and stop in at Marcelo Castro’s recent addition to Baja’s quiet gourmet food and drink revolution. Take the short drive 40 miles east of Ensenada on federal highway 3 to Ojos Negros to see what it’s all about. Now, in addition to incomparable seafood, fantastic organic produce, olive oil and wines all made possible by sea breezes which create a very special micro climate perfect for all these culinary treasures, Marcelo Castro has installed America’s first stone cave for aging artesanal cheeses the way it’s been done for generations in Europe. It makes sense. Marcelo is a fourth generation artesanal cheese producer, following in the footsteps of his Swiss-Italian grandfather who brought the family tradition to Baja, making cheeses for American and Mexican cowboys in the valley historically known as Valle de San Rafael. The family business expanded to include the Ensenada-Tecate-Tijuana triangle, then the entire country of Mexico. Marcelo’s ambitious project allows him to turn out 400 kilos of exquisite artesanal cheeses daily, and the stone cave has a capacity for 10,000 pieces at the perfect humidity and light exposure for European quality cheeses. Artesanal doesn’t just encompass cheese production, either. Marcelo’s grows and feeds their own livestock, milks the cows and takes it from there! And yes, you can drop in on Sundays for a tour that allows you to see just how it’s being done, and to sample the fare, including the Valley’s famous wines. Google Cava de Marcelo for more information. I shut down my kitchen during the time of volcano heat beginning in August, starting up again when the heat dies down in mid-October. However, I have received several requests in August from people who really want a taste of traditional Mexican cooking, so I would like to offer a cook’s tour of Breakfast and Marketing in Mexico to show off Cabo’s recently blossoming traditional food producers and purveyors. The plan is to eat and shop our way through Cabo’s developing traditional food scene while keeping our cool. If this interests you, let me know. I hope to meet you when you come down, and share my passion for Mexican food! June is shaping up to be a really tasty month. We started out in Tabasco with some absolutely addictive chipotle chiles simmered in a piloncillo brine then plump-stuffed with platano macho fried golden in butter with sweet onions, then mashed with fresh orange juice, raisins, chopped toasted walnuts and a good handful of crumbled queso panela for good measure… each one rolled in flour, then egg, then dry breadcrumbs and fried golden crisp and served with cold sour cream to cut the heat… I dream about those chiles! 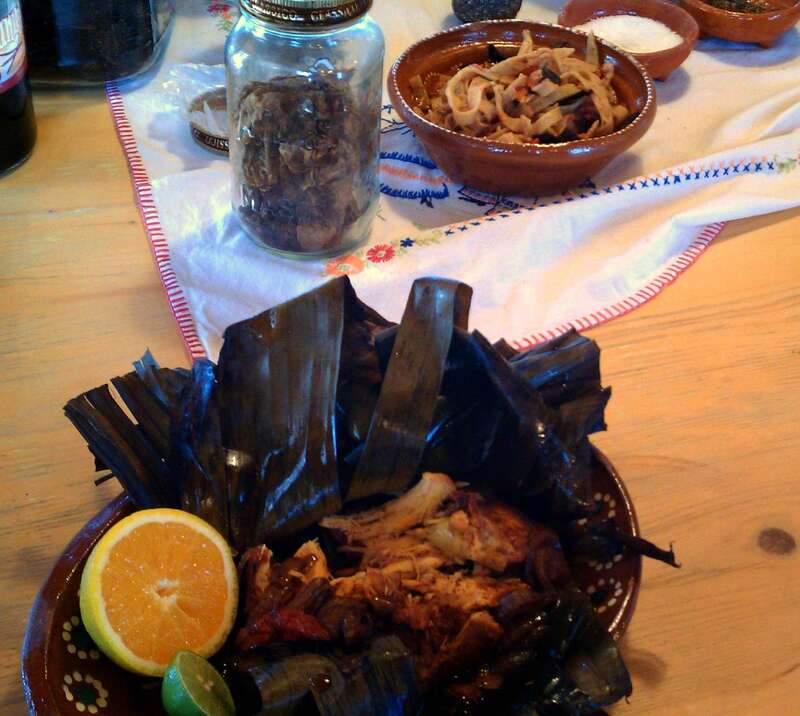 Then yesterday some culinarily adventurous cooks asked for lunch in Yucatan — so off we went! Sopa de Limon is Yucatan’s version of Mexico’s famous and also addictive tortilla soup — with a chunk of habanero simmered in the broth and a good squeeze of sour orange juice to top it off. Papadzules — strange food! Mayan food. This unusual and somewhat baroque offering from Yucatan makes a wonderful breakfast dish — tender corn tortillas are dipped in a toasted pumpkin seed sauce then rolled around chopped hard boiled eggs and served in a pool of spicy tomato sauce. And sure enough, the crock pot is the way to make pibil if you aren’t lucky enough to have a pit barbecue in your back yard. A good friend makes pork the same way and it melts in your mouth! So where will we be off to next? Oaxaca, or maybe Veracruz… the fun part is that we can eat our way through the Republic of Mexico without leaving my cozy Cabo kitchen these days since we can now get pretty much all the ingredients for any regional dish we can dream up right here in town! I’m loving the new Cabo!